Disruption of the TSC protein complex induces loss of pigmentation in melanocytes. (A–D) Highly pigmented iHPMs were infected with lentiviruses expressing TSC1 shRNA or scrambled control (Scr) shRNA and selected with puromycin. 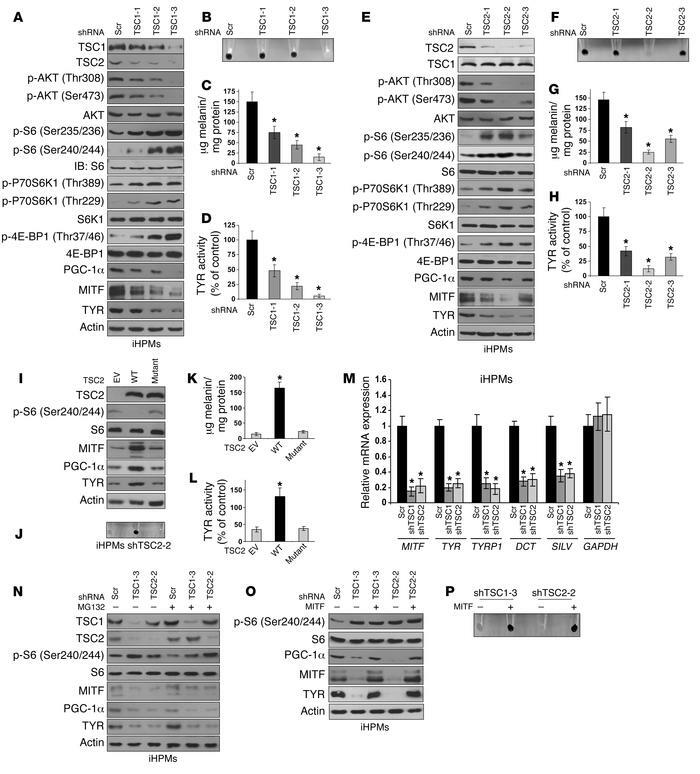 (A) Immunoblot analysis shows that TSC1 depletion led to reduced MITF-M and its downstream targets PGC-1α and TYR, as well as mTORC1 activation. (B) Cell pellets from TSC1-depleted cells had reduced pigmentation. (C and D) TSC1-depleted cells had reduced melanin and TYR activity. (E–H) Entirely similar to the data shown in A–D, except that TSC2 shRNAs were expressed. (I–L) TSC2-depleted iHPMs were reconstituted with lentiviruses containing WT TSC2 or patient-derived TSC2-mutant (P419S) or empty vector control viruses (EV) and selected with puromycin. (I) Immunoblot analysis shows that WT TSC2, but not the TSC2 mutant, rescued mTORC1 activation, MITF and PGC-1α expression, and TYR protein levels. (J) Pigmentation, (K) melanin content, and (L) TYR activity were also all rescued by WT TSC2. Data in C, D, G, H, K, L, and M represent the mean ± SD from at least 3 independent experiments. *P < 0.05, by 2-tailed Student’s t test. (M) Expression of the indicated genes was measured by qPCR in control or shRNA-expressing cells. GAPDH was used as a control. (N) Immunoblot analysis of lysates from TSC1- or TSC2-depleted cells treated with MG132 (25 μM) for 6 hours. MITF, PGC-1α, and TYR were not rescued by MG132 treatment. (O and P) TSC1- or TSC2-depleted cells were infected with lentiviruses containing MITF-M or empty vector control (Scr) and selected with puromycin. (O) Immunoblot analysis shows increased MITF and TYR expression in cells infected with MTIF-M lentivirus. (P) Ectopic expression of MITF rescued the pigmentation loss in TSC1- and TSC2-depleted cells. The immunoblots presented in the figure panels include replicate samples run on parallel gels.